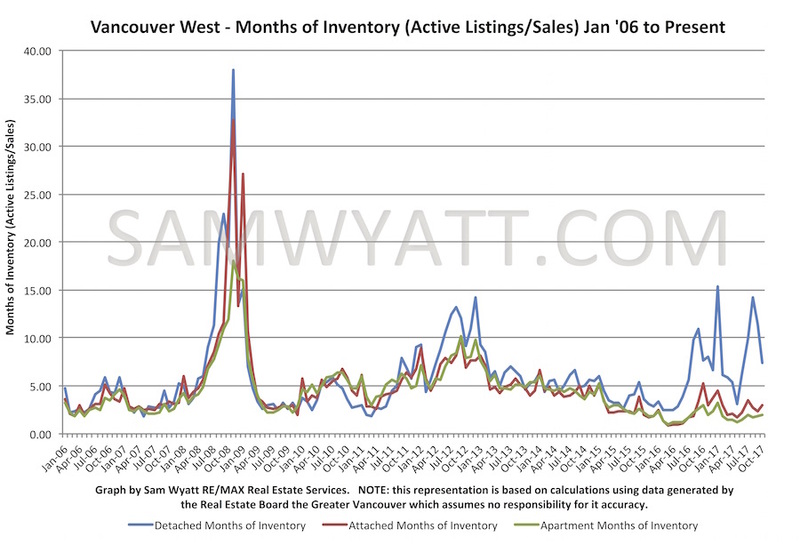 Months of Inventory (MOI)* remains well entrenched in a seller's market for attached homes and apartments but detached homes have seen several spikes deep into buyer's market territory over the past year. 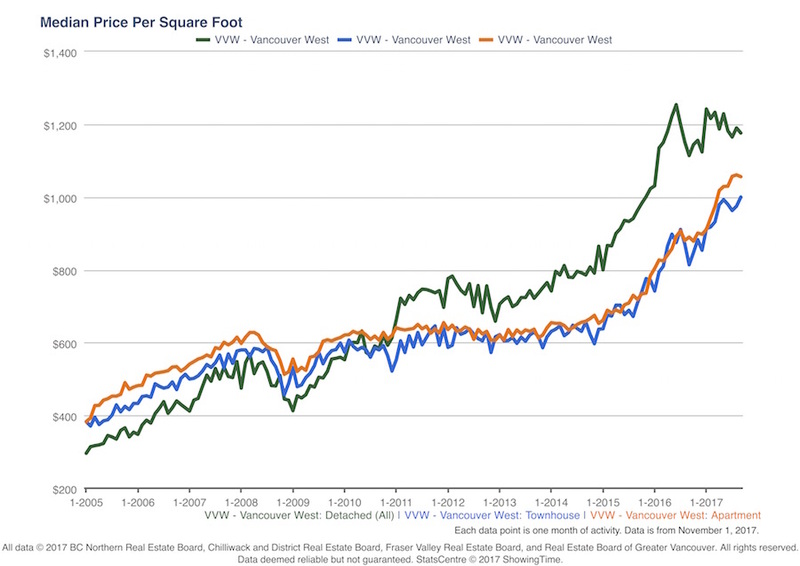 MOI in October 2017 for Vancouver's Westside was 7.39 for houses, 2.94 for Attached homes and 1.94 for apartments. Active listing volumes have been well below the past decade's norm for apartments and it has translated into a super-heated market for them. 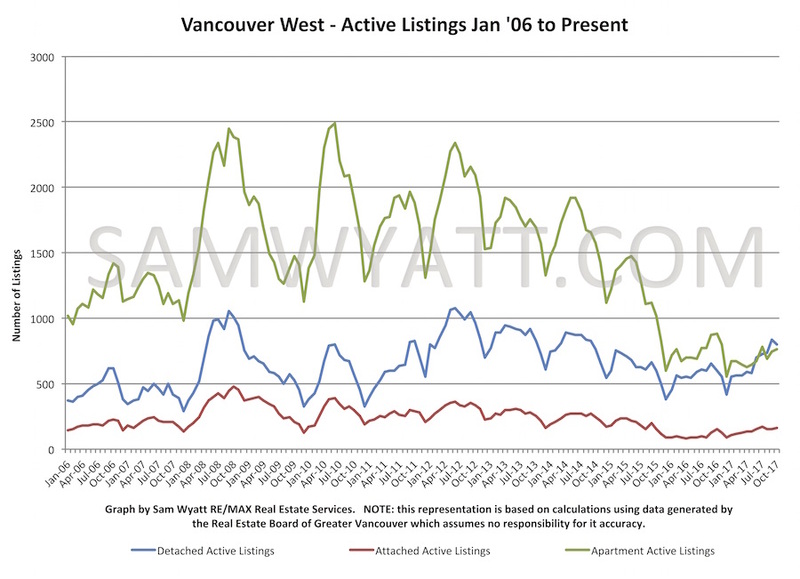 Astoundingly, there have been more Westside active listings for houses than for apartments since August. It is these ultra-low active listing volumes for apartments that have played the largest role in their increasing sale prices. 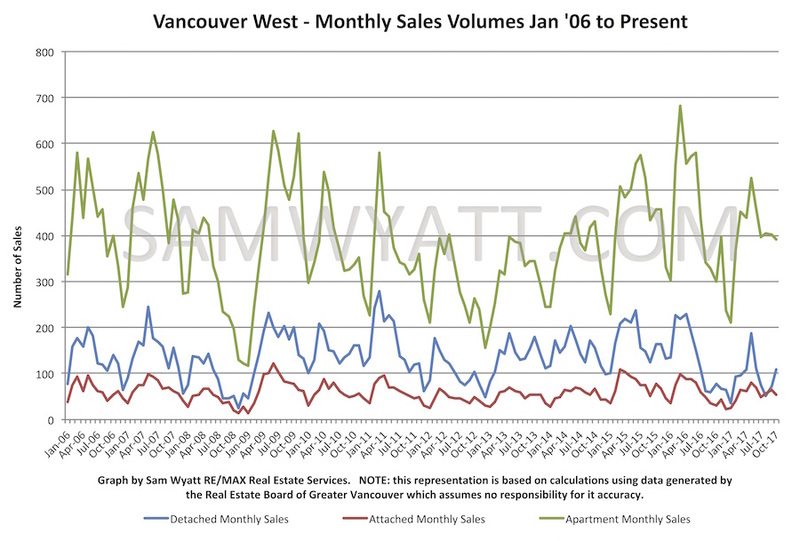 Sales volumes have remained in typical range for apartments and attached homes but have been on the low side for detached homes for most of 2017. Average sale prices for detached homes took a significant dip in January of 2017 but have since recovered to a new high point in October of $4,466,841. If high listing volumes and lower sales volumes continue for houses, we should anticipate their prices to feel downward pressure soon. The biggest real estate news of late has been the Canadian Government's recent rule changes for nationally regulated mortgage lenders. The most significant of these changes is that ALL mortgages will need to be stressed tested against the greater of the Bank of Canada Benchmark Rate or 2% higher than the contract rate of the borrower. The rule comes into effect January 1 2018. That means that any firm contract to purchase a home prior to that date will be able to qualify under the old rules, even if the closing date is after January 1 2018. The effect of this rule will be to lower many people's buying power. 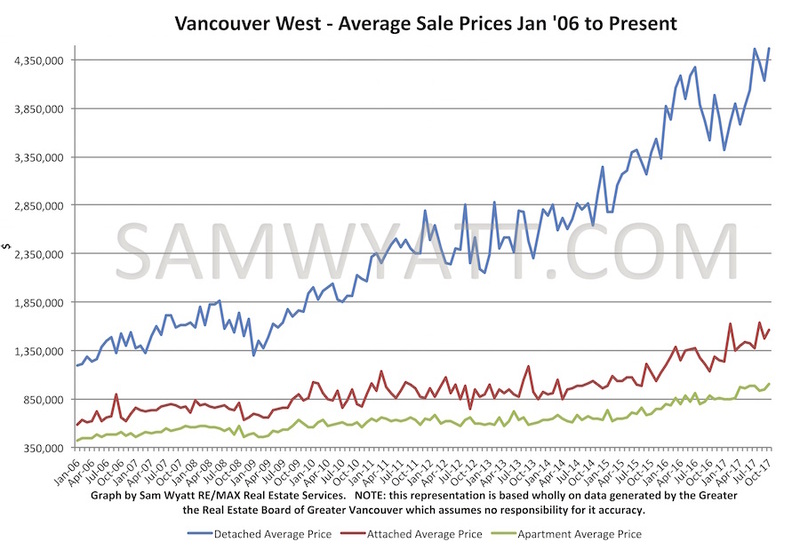 I expect that the resulting effect will be to put even more upward pressure on lower cost apartment pricing. I also expect to see a slightly busier than average November and December real estate market. Note that these rules do not apply to Provincially regulated Credit Unions and small private lenders who will no doubt be too busy to meet the demand.